In the mid-1920s the signs of accelerating development in the village led Martin Coles Harman, then living at ‘Dean’s Place’, to ensure that Chaldon should have an open space while there was still time. In July 1924 he had purchased a 26 acre Lot described as ‘Freehold Arable and Woodland’; it was part of the 107 acre ‘Hilltop Estate’ which formed most of the south west corner of the parish and which was sold as 11 Lots. 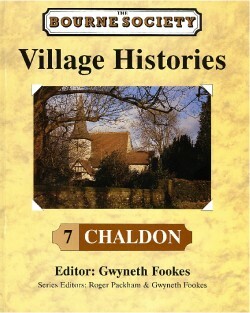 He decided to donate 6.69 of the 26 acres (which was a 6 acre mangold field plus a wooded strip beside Hilltop Lane) to Chaldon’s Parish Meeting for the use of the residents of the village as a sportsfield, with it being immediately passed to the National Trust. The gift to the National Trust was dated 31 December 1926 but the formal presentation took place at the field on Saturday, 28 May 1927 when S O Andrew, the Headmaster of Whitgift School (where Mr Harman had been pupil), handed over the field to Lord Farrar who received it on behalf of the National Trust. Mr Harman was one of six brothers; he also had 5 sisters. Two of the brothers had died by then. (William had been killed in World War I and Andrew had died in an accident in Mysore where he was managing a coffee plantation on behalf of his brother). Mr Harman asked that the field should forever be known as ‘Six Brothers Field’. In 1925 Mr Harman had also bought Lundy Island in the Bristol Channel where he was able to indulge his great interest in the countryside. To establish a link between his two homes he had six granite stones from Lundy placed in a corner of the field to commemorate his brothers. There the stones remain in a silent circle to-day, of special interest in two respects. The circle is the same size as the most frequently occurring of the ancient Stone Circles of Britain, and possibly only one other Stone Circle was installed in this country during the 20th Century. In November 1933 the Sports Sub-Committee of the newly established Chaldon Residents’ Association recommended that the National Trust should appoint a committee to administer the Field. The Committee was to comprise the Association’s Chairman and Vice-Chairman, the Rector, and one representative of each of the clubs using the Field, viz., the Chaldon Cricket Club, the Chaldon Tennis Club and the Spartans Cricket Club. (The latter was a Caterham Club). The National Trust agreed ‘with pleasure’ and a ‘Local Committee of Management’ held its first meeting on 2 May 1935. The Field has been looked after ever since by residents of the village serving on that Committee, assisted by the Trust’s professional staff. The National Trust had given permission in 1928 for Chaldon Cricket Club to use part of the Field and the Club continues to play there. (In the early days when it played matches only on Saturdays and shared the pitch with the Spartans, its annual rent was one shilling, but following the erection of a pavilion, and the departure of the other club, this was increased in 1936 to a guinea. Sunday matches have been played since 1950). Since 1973 there has been a Scouts’ Headquarters on the Field (used also by the village’s Guides) as well as the cricket pavilion. The Old Caterhamians Rugby Club rented a pitch for the 1947/48 season but moved on to the Dene Field at Caterham-on-the-Hill, possibly because, until the early 1960s, cattle and horses grazed on Six Brothers Field. Hay crops were taken from the field until the mid 1980s when it became no longer economic to do so. Times of nationwide celebration see Chaldon residents gathering together on the Field. Last June’s Golden Jubilee was marked by a ‘Village Picnic’, enjoyed by many, with competitions and games for the children, and an extremely energetic inter-road volley ball competition. (In the same tradition a memorial tree will be planted later in the year). But whatever event may be held, Six Brothers Field quickly reverts to a quiet haven on the upper slope of the North Downs, and a reminder of the foresight of one man – Martin Coles Harman.